Deltamarin Ltd, a Finnish maritime engineering and consulting firm has developed a simulation and analysis tool, that allows to study the energy efficiency of ships. The model takes into account not only the vessel speed and fuel consumption, but also the secondary on-board electricity consumers and waste heat recovery. Results are shown in a Sankey diagram like the one below. 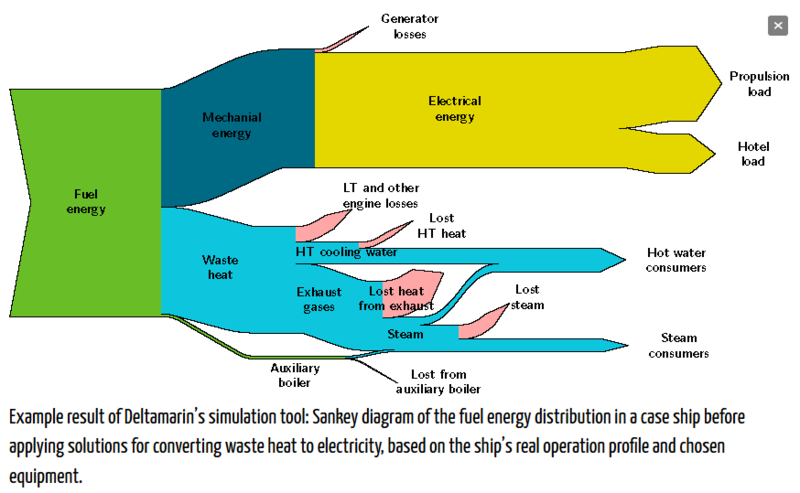 The Sankey diagram in this pic doesn’t show any numbers or unit of flow, so we can only conclude from the arrow magnitudes that about 50% of the energy is lost as heat at the engine (some of which is recovered for heating of water). I am not sure about the propulsion being electric though. The design of the diagram is rather crude and diagonal lines are visibly pixelated. But nevertheless it seems like a good way to get the energy efficiency model result data across other than in a table. Watch this video where a Deltamarin engineer explains the simulation model and also the Sankey diagram. The conference paper ‘Repowering: An option for refurbishment of old thermal power plants in Latin-American countries’ (in: Proceedings of ASME Turbo Expo 2010: Power for Land, Sea and Air GT2010 (June 14-18, 2010, Glasgow, UK). DOI: 10.1115/GT2010-23058) by Irrazabal Bohorquez et al. of the Universidade Federal de Itajubá (UNIFEI) in Brazil has several Sankey diagrams to visualize energy flows in repowered thermal power plants. In the refurbishment scenario gas turbines (GT) are being installed. Exhaust gas is recovered and used in a heat recovery steam generation (HRSG). For each scenatio the cost for generated electricity is assessed as well as the CO2 emissions associated with energy generation. Check out the paper @ Researchgate for more Sankey diagrams. In a presentation on “Low CO2 production in European food and beverage industry” the author Christoph Brunner from AEE – Institute for Sustainable Technologies (AEE INTEC) suggests process flow sheets and Sankey diagrams as tools used for energy efficiency analysis. This Sankey diagram is used as an example for the creation of mass and energy balances and the visualization of the production process. 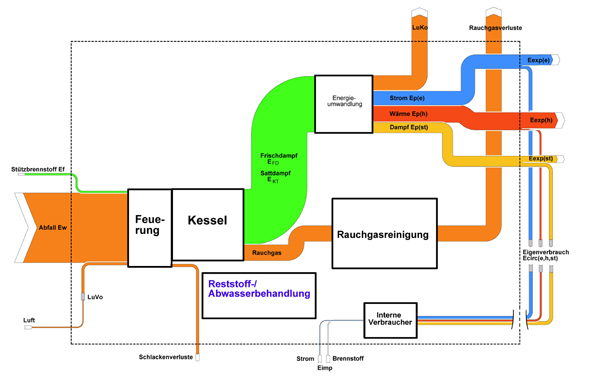 The diagram is from Austria and thefore in German. From translating some words I understand this is probably for a food/dairy industry. Flows are in MWh, but without a time span. Two steam generators (one run with natural gas, the other with petroleum) supply heat to different processes. The cooking chambers (“Kochkammern”) require most, followed by “Selch” (?) and heating of a “KSPW Tank”. Some heat is recovered from condensate. Sankey diagrams can help understanding the energy flows of process systems and detect hotspots for optimization. 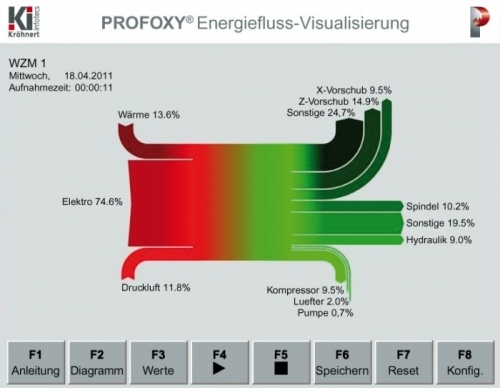 Consulting firm Rytec analyzes energy and heat utilization level of Swiss waste incineration plants and visualizes the processes using Sankey diagrams. This Sankey diagram from their website is a simplified view and offers no details as to the actual figures. More detail can be found in this project summary (PDF). Diagram labeled in German, but thanks to my friend Google Translate, I can identify ‘heating’, ‘boiler’, ‘energy conversion’ and ‘flue gas losses’. Orange streams to the top are losses. 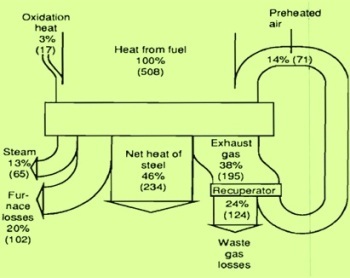 This Sankey diagram of energy flows in a “pusher type reheating furnace” illustrates an article on ‘Reheating Furnaces in Steel Plants’ by Satyendra on the ISPAT Guru blog. Unit of flow is not clear, but the main stream arriving from the top represents the baseline 100% (508 units) of which a portion can be recuperated and fed back into the furnace as preheated air.